Build an online enrollment form that parents can fill out in order to be placed on waitlist or accepted as a new family at your school. You can have parents sign any required waivers, accept registration fees via credit card, and track the family's progress through your enrollment pipeline. Click on the "Create Form" button highlighted by the blue bar toward the top of the page. On the following screen, you'll be able to customize the fields of your form. There are different tabs for Student Information, Parent Information, Authorized Pick-Ups, and Policy & Waivers. While some fields are preselected as required fields, at minimum the form requires the name of the student. For all other fields, you can hover your mouse over them and click on the pencil icon to edit or the trashcan icon to delete the field (highlighted in the snapshot above). By clicking on the Add Field button, you'll see all of the possible fields you can add to the form. Within the "Create New Field" editor, you have the option to choose a different field using the "Choose Field Type" drop-down menu. You'll also see a sentence explaining how that particular field type will work in the form. Beneath that will be the specific content for that field. 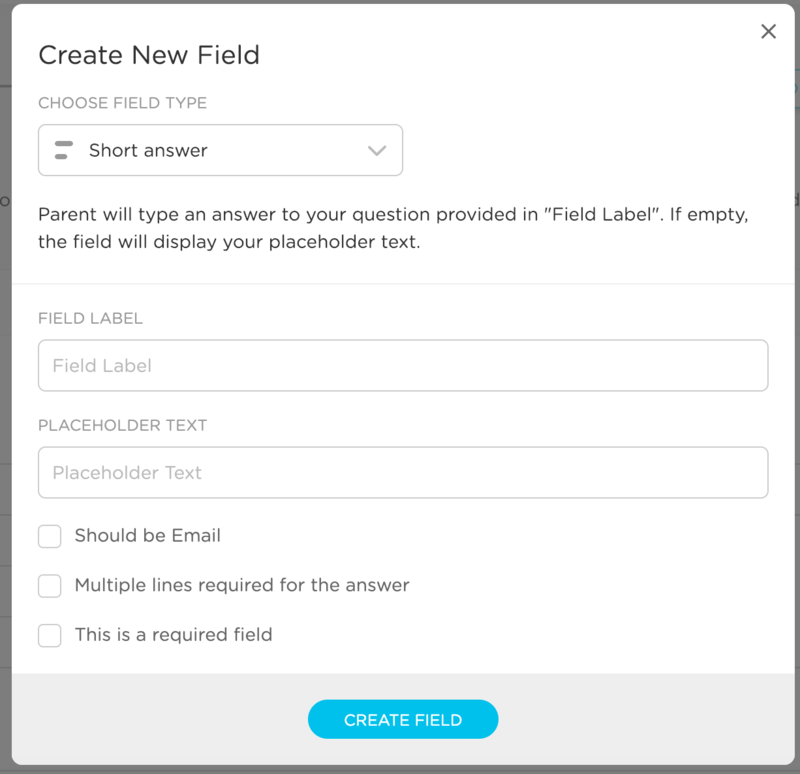 In this case, you have the option to add a short answer question and include placeholder text (the text that appears in the box before something is typed). Finally, you have a few check-box options. "Should be Email" will require the parent to answer in the format of an email address. "Multiple lines required for the answer" will make the answer text box appear larger. "This is a required field" will place a red asterisk next to the field. The parent won't be able to move on to the next screen without answering this question. 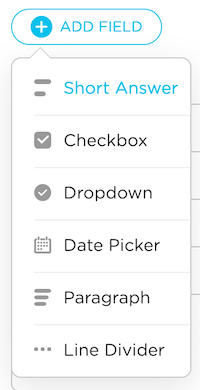 When you've finished editing your field, click on "Create Field" to add it to your form. I would recommend creating one of each field type just so you know how it will look in the form. You can always delete the test fields later. Click on the "Preview Form" button in the upper right to see how your form will look to the parents once it's been published. You'll notice that your school logo and information is featured on the form. If you want to add a logo or make any changes to your school information, go to School Settings > School Profile. If you need a break while working on the form, click on the "Save & Exit" button at the bottom of the screen. 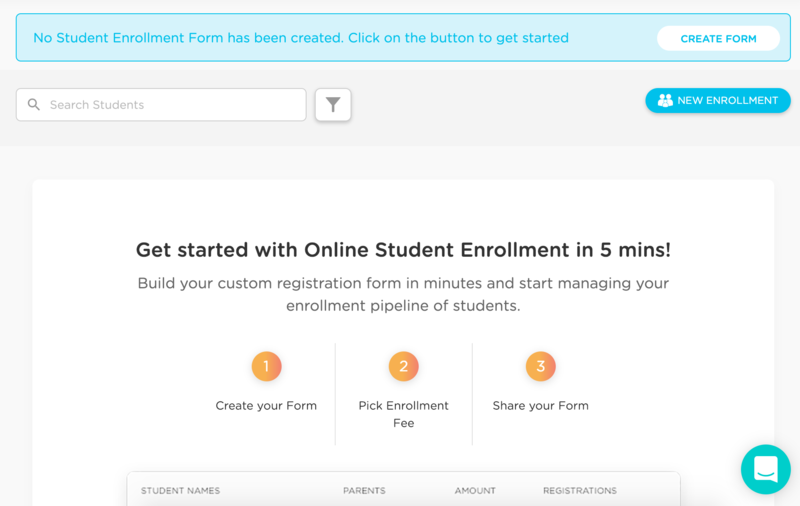 This will save your current progress on the form and take you back to the main enrollment screen. To continue working on your form, click on the "Edit Form" button highlighted by the blue bar at the top of the Enrollments page. After you've published the form, you can edit it anytime by clicking on the pencil icon in the upper right of the Enrollments page. To finalize your changes, you'll need to click on the "Publish Form" button again on Step 3 (Share the Form). 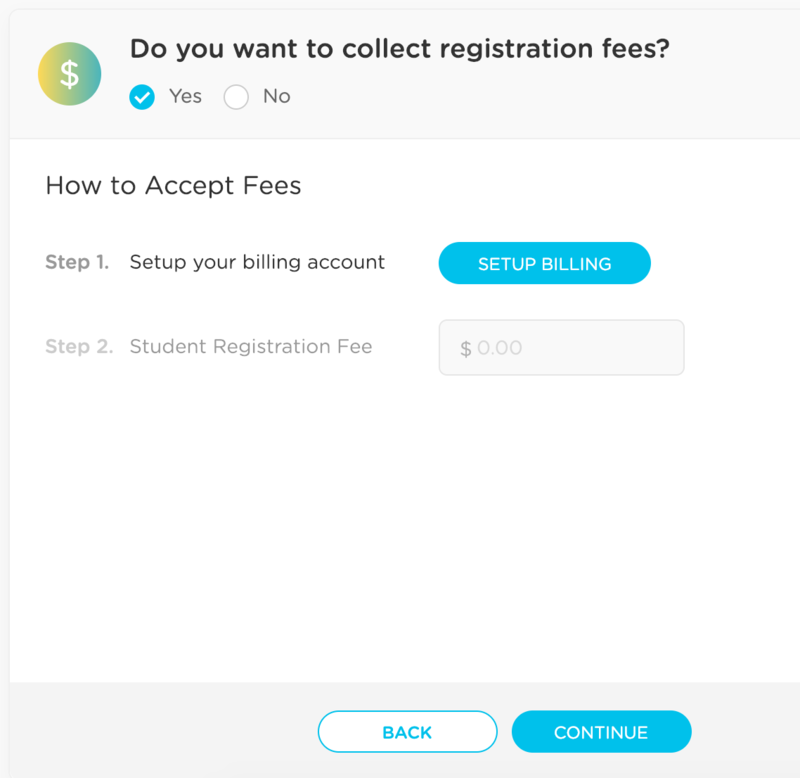 Once you've finished creating the form, you will be taken to step 2, which asks if you want to collect registration fees online as part of the enrollment process. If you do want to collect fees, you will need to have a bank account in place to accept payments from parents. 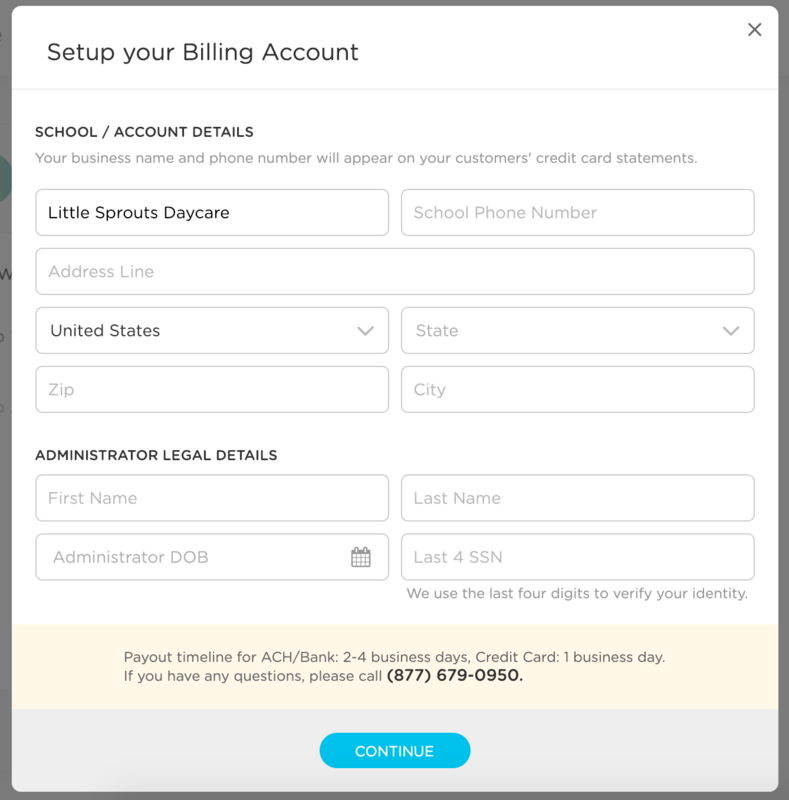 For schools that haven't already set up billing through the Billing section of the website, you will be able to click the "Setup Billing" button to enter your information and begin accepting registration payments. Note: You will still need to complete the Set Up billing process under the Billing section to accept online payments for regular invoices. The majority of information will have already been filled out; you will mainly need to decide whether you want the school or parents to take on transaction fees for invoice payments. If you don't want to collect registration fees online, simply check No and move on to the next step. 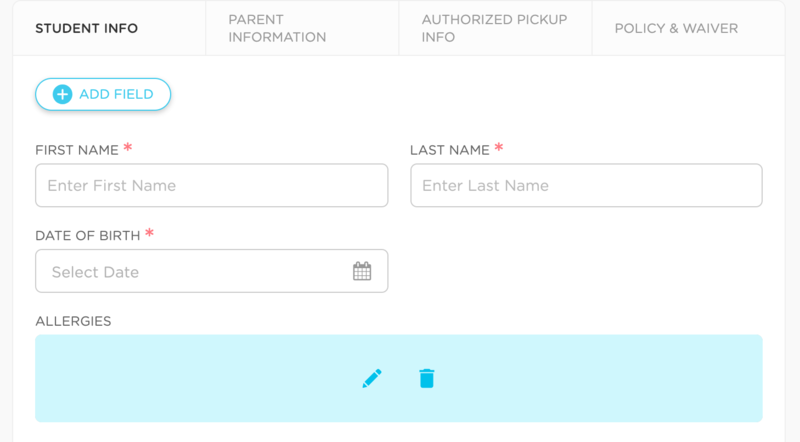 Once the form is complete, you'll be able to click on the "Publish Form" button so that parents will be able to fill it out once provided with the link. If you ever need to Unpublish the form, you can click on the link highlighted in red below. 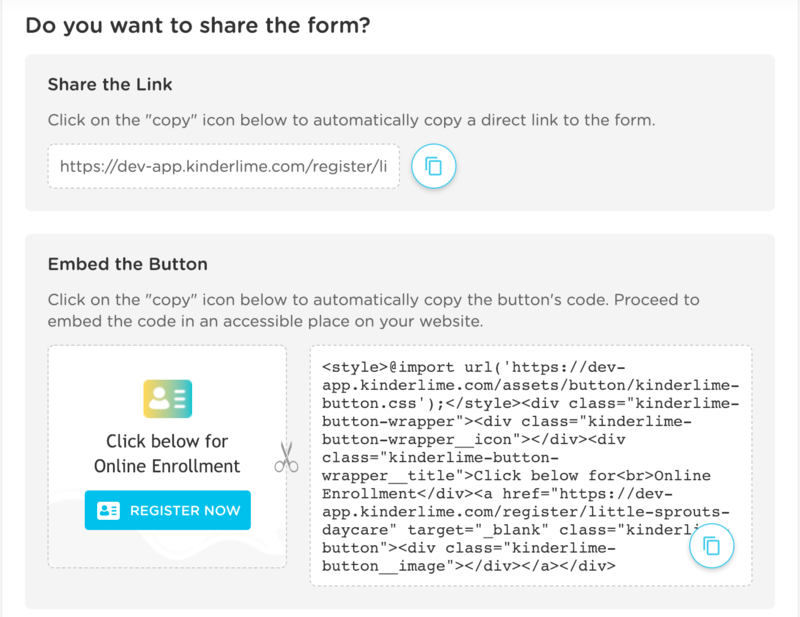 You can then copy the form URL to share with parents, or embed the form as a button on your website. To see an example of a simple code editor that you can use to edit the code and copy for your website, please click here. Here is our help article with more details on sharing the form.